Repetitive DNA is a major fraction of eukaryotic genomes and occurs particularly often in plants. Currently, the sequencing of the sugar beet (Beta vulgaris) genome is under way and knowledge of repetitive DNA sequences is critical for the genome annotation. We generated a c0t-1 library, representing highly to moderately repetitive sequences, for the characterization of the major B. vulgaris repeat families. While highly abundant satellites are well-described, minisatellites are only poorly investigated in plants. Therefore, we focused on the identification and characterization of these tandemly repeated sequences. Analysis of 1763 c0t-1 DNA fragments, providing 442 kb sequence data, shows that the satellites pBV and pEV are the most abundant repeat families in the B. vulgaris genome while other previously described repeats show lower copy numbers. We isolated 517 novel repetitive sequences and used this fraction for the identification of minisatellite and novel satellite families. Bioinformatic analysis and Southern hybridization revealed that minisatellites are moderately to highly amplified in B. vulgaris. FISH showed a dispersed localization along most chromosomes clustering in arrays of variable size and number with exclusion and depletion in distinct regions. The c0t-1 library represents major repeat families of the B. vulgaris genome, and analysis of the c0t-1 DNA was proven to be an efficient method for identification of minisatellites. We established, so far, the broadest analysis of minisatellites in plants and observed their chromosomal localization providing a background for the annotation of the sugar beet genome and for the understanding of the evolution of minisatellites in plant genomes. Repetitive DNA makes up a large proportion of eukaryotic genomes . Major findings in the last few years show that repetitive DNA is involved in the regulation of heterochromatin formation, influences gene expression or contributes to epigenetic regulatory processes [2–7]. Therefore, understanding the role of repetitive DNA and the characterization of their structure, organization and evolution is essential. A rapid procedure to identify repetitive DNA is based on c0t DNA isolation , which is an efficient method for the detection of major repetitive DNA fractions as well as for the identification of novel repetitive sequences in genomes . The c0t DNA isolation is based on the renaturation of denaturated genomic DNA within a defined period of time and concentration. The rate at which the fragmented DNA sequences reassociate is proportional to the copy number in the genome  and therefore, c0t DNA isolated after short reassociation time (e.g. c0t-1) represents the repetitive fraction of a genome. Recently, analyses of c0t DNA were performed in plants e.g. for Zea mays, Musa acuminata, Sorghum bicolor and Leymus triticoides [8, 10–12]. Satellite DNA consisting of tandemly organized repeating units (monomers) of relatively conserved sequence motifs is a major class of repetitive DNA. Depending on monomer size, tandem repeats are subdivided into satellites, minisatellites and microsatellites and tandem repeats with specific functions such as telomeres and ribosomal genes. The monomer size of minisatellites varies between 6 to 100 bp  and those of microsatellites between 2 to 5 bp . Most plant satellites have a monomer length of 160 to 180 bp or 320 to 370 bp . Satellite DNAs are non-coding DNA sequences, which are predominantly located in subterminal, intercalary and centromeric regions of plant chromosomes. The majority of typical plant satellite arrays are several megabases in size . In contrast, arrays of minisatellites vary in length from 0.5 kb to several kilobases . Minisatellites are often G/C-rich and fast evolving  and thought to originate from slippage replication or recombination between short direct repeats  or slipped-strand mispairing replication at non-contiguous repeats . Minisatellites are poorly investigated in plants. So far, only a few minisatellites were described, for example in Arabidopsis thaliana, O. sativa, Triticum aestivum, Pisum sativum and some other plant species [18–26]. Moreover, only two minisatellite families were physically mapped on plant chromosomes using fluorescent in situ hybridization (FISH) . The sequencing of the sugar beet (Beta vulgaris) genome, which is about 758 Mb in size  and has been estimated to contain 63% repetitive sequences , is under way and the first draft of genome sequence is currently established . Knowledge about repetitive DNA and their physical localization is essential for the correct annotation of the sugar beet genome. Therefore, we detected and classified the repeated DNA fraction of B. vulgaris using sequence data from cloned c0t-1 DNA fragments. We focused on the investigation of novel tandem repeats and characterized nine minisatellite and three satellite families. Their chromosomal localization was determined by multicolor FISH and the organization within the genome of B. vulgaris was analyzed by Southern hybridization. In order to analyze the composition of the repetitive fraction of the B. vulgaris genome, we prepared c0t-1 DNA from genomic DNA and generated a library consisting of 1763 clones with an average insert size between 100 to 600 bp providing in total 442 kb (0.06% of the genome) sequence data. For the characterization of the c0t-1 DNA sequences we performed homology search against nucleotide sequences and proteins in public databases and classified all clones based on their similarity to described repeats, telomere-like motifs, chloroplast-like sequences as well as novel sequences lacking any homology (Figure 1). More than half of the c0t-1 fraction (60%) belongs to known repeat classes including mostly satellites. In order to determine the individual proportion of each repeat family we applied BLAST analysis using representative query sequences of each repeat. We observed that the relative frequency of repetitive sequence motifs found in the c0t-1 library correlates with its genomic abundance in B. vulgaris: The most frequently occurring repeat is pBV (32.8%, 579 clones), [EMBL:Z22849], a highly repetitive satellite family that is amplified in large arrays in centromeric and pericentromeric regions of all 18 chromosomes [30, 31]. The next repeat in row has been observed in 19.5% of cases (343 clones) and belongs to the highly abundant satellite family pEV [EMBL:Z22848] that forms large arrays in intercalary heterochromatin of each chromosome arm . The c0t-1 DNA library also enabled the detection of moderately amplified repeats. Telomere-like motifs of the Arabidopsis-type were detected in 1.1% (20 clones) while a smaller proportion of sequences belong to the satellite family pAv34 (0.9%, 16 clones), [EMBL:AJ242669] which is organized in tandem arrays at subtelomeric regions . Only 0.1% (2 clones) belong to the satellite families pHC28 [EMBL:Z22816]  and pSV [EMBL:Z75011] , respectively, which are distributed mostly in intercalary and pericentromeric chromosome regions. Furthermore, microsatellite motifs were found in 1.7% of c0t-1 sequences . Miniature inverted-repeat transposable elements (MITEs) [EMBL:AM231631], derived from the Vulmar family of mariner transposons , were identified in 0.3% (6 clones) of the c0t-1 sequences, while Vulmar [EMBL:AJ556159]  was detected in a single clone only. The repeat pRv [EMBL:AM944555] was found in a relatively low number of c0t-1 sequences (0.4%, 7 clones) indicating lower abundance than the satellite pBV. pRv is only amplified within pBV monomers and forms a complex structure with pBV . Surprisingly, the homology search enabled the detection of a large amount of c0t-1 sequences (13.6%) that show similarities to chloroplast DNA. Classification of isolated c 0 t-1 DNA sequences. A: Absolute and relative distribution of 1763 c0t-1 sequences of the B. vulgaris genome. B: Number of clones (known repeats in A) with similarities to previously described B. vulgaris repeats. C: Classification of novel repetitive sequences. The identification of novel repetitive sequences was an aim of the c0t-1 analysis. Altogether, we identified 29.3% (517 clones) of the c0t-1 sequences lacking homology to previously described B. vulgaris repeats. However, to verify the repetitive character of each sequence motif we performed BLAST search against available B. vulgaris sequences. 56582 BAC end sequences (BES) , (Holtgräwe and Weisshaar, in preparation) covering 5.2% of the genome were used for analysis. 360 c0t-1 sequences showed hits in BES ranging from 11 to 300 while 39 sequences showed more than 300 hits and 118 sequences less than 10 hits. This observation indicates that many of these yet uncharacterized c0t-1 clones contain sequence motifs that are highly to moderately amplified in the genome. We performed an assembly of the 517 uncharacterized c0t-1 clones to generate contigs, which contain sequences belonging to an individual repeat family. In total, 37 contigs ranging in size from 149 bp to 1694 bp (average size 555 bp) were established. The largest contig in size and clone number (1694 bp, 20 sequences) was used for BLAST search against available sequences. Analysis of the generated alignment revealed a LTR of a retrotransposon. The full-length element designated Cotzilla was classified as an envelope-like Copia LTR retrotransposon related to sireviruses . The internal region of Cotzilla showed similarity to 40 sequences of 118 c0t-1 clones categorized as retrotransposon-like (Figure 1C) showing that Cotzilla is the most abundant retrotransposon within the c0t-1 library. Analysis of a further contig (1081 bp, 4 clones) resulted in the identification of the LTR of a novel Gypsy retrotransposon (unpublished) that shows 13 hits within the c0t-1 library. Three further clones displayed similarities to transposons. The remaining uncharacterized c0t-1 clones (396 sequences) were used for the identification of tandemly arranged repeats. Plant minisatellites do not have typical conserved sequence motifs, therefore the analysis of c0t DNA is a useful method for the targeted isolation of minisatellites. We scanned the 396 clones of the c0t-1 library that show no similarity to known repeats and detected 35 sequences that contain tandemly repeated sequences. Based on their similarity these sequences were grouped into nine minisatellite families and three satellite families. The minisatellites were named according to their order of detection and the satellites according to conserved internal restriction sites (Table 1). A sequence of each tandem repeat family was used as query and blasted against available sequences to identify additional B. vulgaris copies. Alignments of all sequences of each tandem repeat family were generated and the average monomer size, the G/C-content and the identity values of at least 20 randomly selected monomers determined (Table 1). The tandem repeats are listed according to their monomer size. In order to investigate the genomic organization and abundance of the tandem repeats, Southern hybridizations were carried out. A strong hybridization smear of a wide molecular weight range was detected in each case indicating abundance of the minisatellite families in the genome of B. vulgaris (Figure 2A - G). Distinct single bands were observed for the minisatellite families BvMSat10 (Figure 2, H) and BvMSat11 (Figure 2, I). Because of the short length, recognition sites for restriction enzymes are rare or absent within minisatellite monomers. Thus, genomic DNA was restricted with 15 different restriction enzymes to identify restriction enzymes generating mono- and multimers in minisatellite arrays detectable by Southern hybridization. Figure 2 illustrates the probing of genomic DNA after restriction with the 5 restriction enzymes generating most ladder-like patterns in minisatellite and satellite arrays. A typical ladder-like pattern is detectable for BvMSat04 (Figure 2C, lane 1) and BvMSat03 (Figure 2B, lane 2). Multiple restriction fragments were observed after hybridization of BvMSat08 (Figure 2F). The tandem organization of the minisatellites lacking restriction sites was confirmed by sequence analysis or PCR (not shown). Typical ladder-like patterns were generated for each satellite family. For example, the tandem organization was verified for the FokI satellite, AluI satellite and HinfI satellite after restriction with AluI (Figure 2, J-L, lane 3,). Southern hybridization of genomic B. vulgaris DNA with probes of tandem repeats identified in the c 0 t-1 library. Genomic DNA was restricted with NdeI (1), BsmAI (2), AluI (3), HpaII (4) and MspI (5) and hybridized with BvMSat01 (A), BvMSat03 (B), BvMSat04 (C), BvMSat05 (D), BvMSat07 (E), BvMSat08 (F), BvMSat09 (G), BvMSat10 (H), BvMSat11 (I) and the FokI-satellite (J), AluI-satellite (K) and HinfI-satellite (L). To investigate the DNA methylation of the tandem repeats in CCGG motifs, genomic DNA was digested with methylation sensitive isoschizomeres HpaII and MspI. HpaII only cuts CCGG, whereas MspI cuts CCGG and CmetCGG . 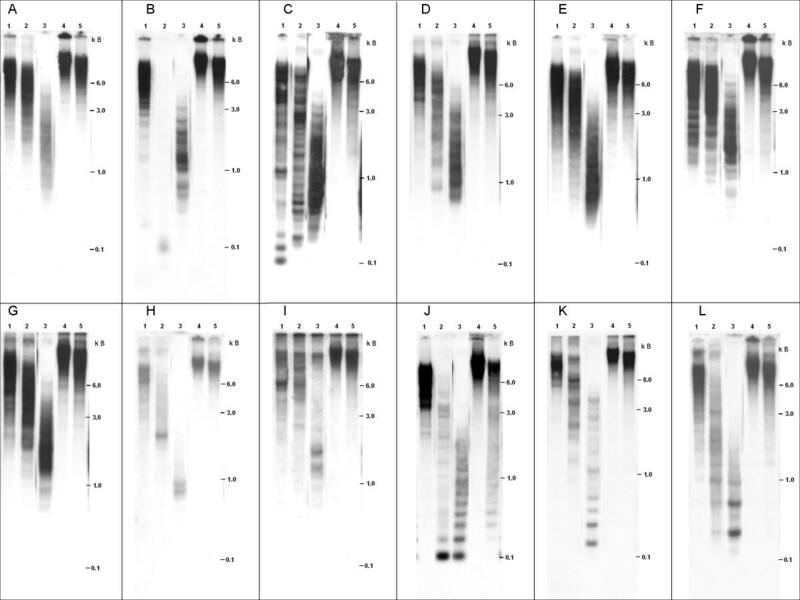 We detected very large DNA fragments generated by restriction with HpaII and MspI, which were not resolved by conventional gel electrophoresis indicating reduced restriction of DNA in most minisatellites and adjacent regions (Figure 2, A - I, lane 4 and 5). The DNA methylation of CCGG motifs in AluI and HinfI satellite arrays was observed by the hybridization to very large DNA-fragments (Figure 2, K - L, lane 4 and 5). 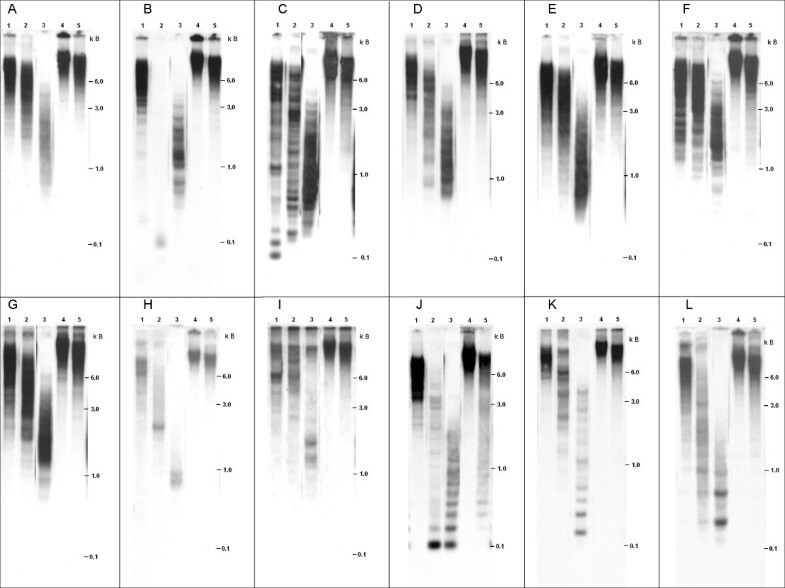 However, the presence of several small DNA fragments and signals of multimers after restriction with MspI (Figure 2J, lane 5) indicates no CNG methylation of some FokI satellite arrays (Figure 2, J, lane 5). The physical distribution of the minisatellite and satellite families on mitotic metaphase chromosomes of B. vulgaris was investigated by fluorescent in situ hybridization (FISH) (Figure 3). For the visualization of chromosome morphology and structure, metaphase nuclei were stained with DAPI (blue fluorescence in Figure 3). Euchromatin is detectable by less DAPI staining, while stronger intensity indicates heterochromatic regions such as centromeres and pericentromeres. In order to identify chromosome pair 1, metaphase chromosomes were hybridized with 18S-5.8S-25S-rRNA genes (green signals in Figure 3) that show strong signals in terminal regions on one pair of chromosomes. The still decondensed rDNA is displaced or disrupted in some metaphases resulting in additional signals (e.g. Figure 3, K and 3J). Physical mapping of tandem repeats on mitotic metaphase chromosomes and interphase nuclei of B. vulgaris using FISH. Blue fluorescence (DAPI stained DNA) shows the morphology of chromosomes. Red signals show chromosomal localization of the tandem repeats and green signals show position of 18S-5.8S-25S rRNA genes on the chromosomes. Hybridization with the minisatellites BvMSat01 (A), BvMSat03 (B), BvMSat04 (C), BvMSat05 (D), BvMSat07 (E), BvMSat08 (F), BvMSat09 (G), BvMSat10 (H), BvMSat11 (I) on mitotic metaphases and probes of the FokI-satellite (J), the AluI-satellite (K) and the HinfI-satellite (L) on mitotic metaphases and interphase nuclei reveals characteristic chromosomal distribution patterns. Using minisatellites as probes, similarities in the chromosome distribution patterns were preferentially observed in the intercalary heterochromatin and for some minisatellites in terminal regions as dispersed signals. Only weak signals were detectable in centromeric or pericentromeric regions. Different chromosomes show a variation in signal strength and, hence, in copy numbers or expansion of minisatellite arrays (e.g. Figure 3, A-C, F and 3G). While some chromosomes show stronger banding patterns indicating larger arrays or clustering of multiple arrays, on other chromosomes weak or no signals were revealed (e.g. Figure 3, F and 3G), which shows that minisatellite arrays are often small in size. The detection of signals on both chromatids of many chromosomes verifies the hybridization pattern. Physical mapping using probes of the minisatellite families BvMSat08 and BvMSat09 shows particular hybridization patterns enabling the discrimination of B. vulgaris chromosomes (Figure 3, F and 3G). A peculiar hybridization pattern was observed for BvMSat08, which shows massive amplification of signals in the intercalary heterochromatin (Figure 3, F), which are localized on one chromosome arm of a single chromosome pair indicating very large arrays of multiple BvMSat08 copies or clustering of arrays. Four chromosomes show only reduced signals indicating a lower number of BvMSat08 arrays on these chromosomes. The minisatellite BvMSat09 shows massive accumulation of clusters in the intercalary heterochromatin on twelve chromosomes (Figure 3, G). Six of them are identifiable by blocks on both chromosome arms, whereas the other chromosomes are characterized by blocks on one chromosome arm only. For the physical mapping of satellites identified in the c0t-1 library we hybridized metaphase chromosomes and also interphase nuclei, which enable the detection of signals at higher resolution (Figure 3, J-L). The FokI-satellite shows a co-localization with DAPI-positive intercalary heterochromatin (Figure 3, J). However, the signals are not uniformly distributed and differ in signal strength. Hybridization was also detected at terminal euchromatic chromosome regions, consistent with the FokI-satellite hybridization pattern in interphase nuclei in low DAPI-stained euchromatic regions (arrows in Figure 3, J). Strong clustering of AluI-satellite arrays was observed in the intercalary heterochromatin on four chromosomes, while eight chromosomes show a weaker hybridization pattern (Figure 3, K). The remaining six chromosomes show very weak signals indicating that AluI-satellites are also present in low copy numbers. The hybridization pattern in interphase nuclei shows that most AluI-satellite signals are localized within heterochromatic chromosome regions adjacent to euchromatic regions. Hybridization with probes of the HinfI-satellite shows a different pattern. Signals of the HinfI-satellite are mostly localized in terminal chromosome regions: twelve chromosomes show hybridization on both chromosome arms, while signals only on one chromosome arm are detectable on the remaining six chromosomes (Figure 3, L). Hybridization on interphase nuclei revealed the preferred distribution of HinfI-satellites in euchromatic regions (arrows in Figure 3, L), while only reduced signals are notable in heterochromatic blocks. Among the c0t-1 sequences, we identified an array of a microsatellite motif with the consensus sequence GATCA. Within several c0t-1 sequences, three short imperfect repeats (GAAAA, AATAA and GTTCA) were interspersed within arrays of GATCA monomers. In order to examine whether this interspersion is conserved, we analyzed B. vulgaris sequences possessing GATCA-microsatellite arrays and detected that the minisatellite BvMSat07 is derived from the GATCA-microsatellite. A typical BvMSat07 monomer, which is 30 bp in size, consists of one GAAAA, one AATAA, one GTTCA motif conserved in this order and three adjacent GATCA monomers, respectively (Figure 4). The analysis of 20 randomly selected minisatellite BvMSat07 monomers revealed that most monomers show an identical arrangement of these short subrepeats and that these monomers share a similarity of 90% to 100%. BvMSat07 is composed of microsatellite complex repeats. 30 bp monomers of BvMSat07 are typically composed of degenerated and conserved GATCA-motifs (as example an array of the BAC end sequence FN424407 is shown). The 21 bp minisatellite BvMSat05 varies considerably in nucleotide composition. Sequence identity analysis of 450 monomers originating from c0t-1 and BAC end sequences revealed that monomers show identities between 38% and 100%. BvMSat05 shows a particular genomic organization: In addition to the head to tail organization, a head to head junction is detectable within multiple BvMSat05 arrays (Figure 5). Identity values between 35% and 100% of the monomers within the inverted arrangement of the two arrays are similar to the values of head to tail monomers. 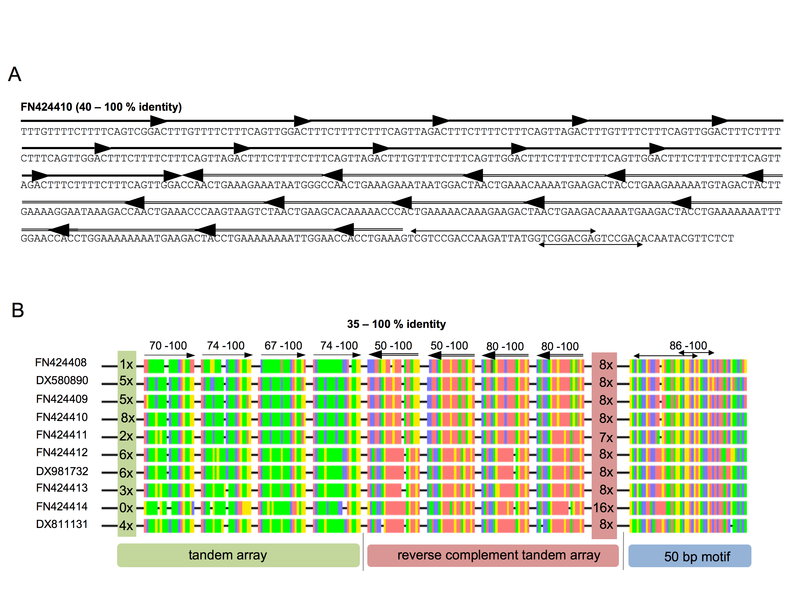 The tandem arrays of the head to head junction are flanked one-sided by the conserved sequence motif GTCGTCCGACCAAAGATTATGGTCGGACGAGTCCGACACAATACGTTCTCT, which is 50 bp in size and shows identity of 86% to 100% (Figure 5). Interestingly, this sequence comprises two palindromic motifs (TCGTCCGACCAAAGATTATGGTCGGACGA and GTCGGACGAGTCCGAC) (arrows in Figure 5). Illustration of the head to head junction of BvMSat05 arrays. A: The BAC end sequence FN424410 contains a head to head junction of two head to tail BvMSat05 arrays (arrows and double-lined arrows). B: An alignment of ten BAC end sequences illustrates the typical head to head junction of two head to tail arrays. For each array four monomers, which are separated by a gap, are shown. The number at the left and right borders of the arrays corresponds to the number of monomers that are not displayed in this illustration. The nucleotides are color-encoded: Red for adenine, blue for cytosine, yellow for guanine and green for thymine. The tandem arrays are flanked one-sided by a highly conserved 50 bp motif, which comprises two palindromic sequences (double arrows). Identity values are displayed in percent. The aim of this study was the characterization of the repetitive fraction of the B. vulgaris genome. We generated and analyzed 1763 highly and moderately repetitive sequences from a c0t-1 DNA library. Our results revealed that the majority of sequences in the c0t-1 library are copies of the satellite families pBV  and pEV  while other known repeats of the B. vulgaris genome are underrepresented. According to the copy numbers within the c0t-1 library, the satellite pBV is the most abundant satellite family in the genome of B. vulgaris followed by the pEV satellite family. This observation is consistent with the prediction that the number of copies of a repeat family in c0t DNA correlates with its abundance in the genome . So far, c0t DNA isolation has been performed in several plant genomes. c0t DNA libraries representing highly repetitive sequences were generated from genomic DNA of S. bicolor, M. acuminata and L. triticoides [8, 11, 12] while moderately repetitive DNA fractions were isolated from S. bicolor and Z. mays [8, 10]. The c0t analysis enabled the identification of novel repeats, as well as the detection of most abundant repeat classes within a plant genome. c0t-1 DNA analysis performed in the L. triticoides genome revealed a highly abundant satellite family  which is similar to the observation that most c0t-1 clones of B. vulgaris belong to satellite DNA. 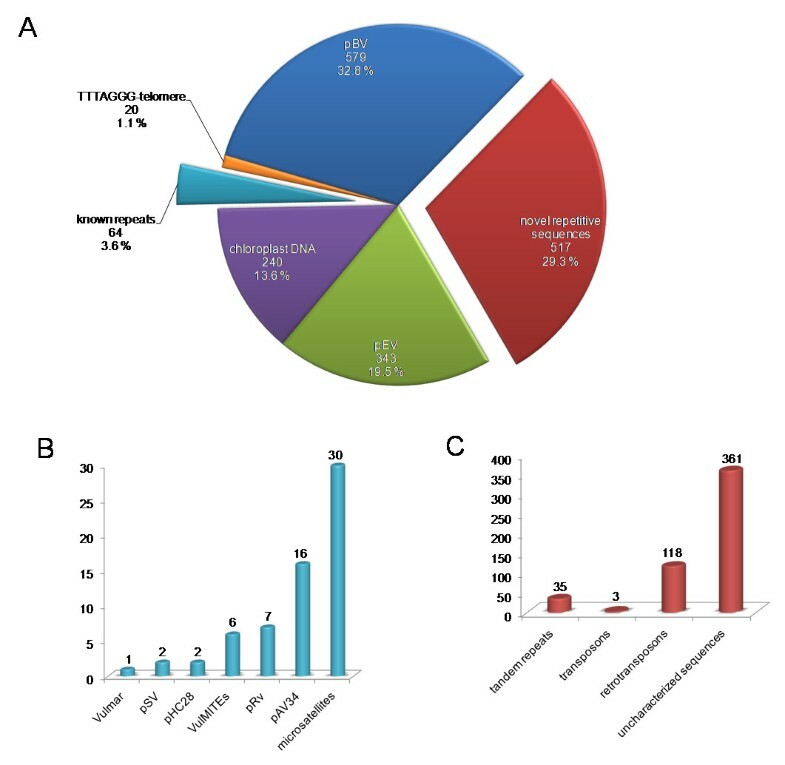 In contrast, the most abundant repeats detected in the c0t libraries of S. bicolor, M. acuminata and Z. mays belong to retrotransposons or retrotransposon-derived sequences. No significant number of tandemly repeated sequences (except ribosomal genes in the M. acuminata and S. bicolor genome) has been observed indicating that retrotransposons constitute the main repetitive fraction in these genomes [8, 10, 11]. The detection of the relatively low number of Miniature inverted-repeat transposable elements (MITEs) in the c0t library of B. vulgaris is in contrast to the large number of MITEs that has been described  and indicates a possible bias during library construction. A possible reason for the low frequency of MITEs in c0t-1 DNA might be related to the intramolecule renaturation via terminal inverted repeats (TIRs) of single stranded sequences containing MITEs. TIRs of MITEs in B. vulgaris are relatively short  and c0t clones containing inserts less than 50 bp have been excluded, hence, short MITE sequences have been escaped from analysis. A possible explanation for the differences in the number of organelle-derived sequences within c0t libraries might be related to plastid and mitochondrial DNA which was isolated together with nuclear DNA. Hribová et al. (2007) and Yuan et al. (2003) isolated the c0t-0.05 DNA and the c0t-100 fraction from the M. acuminata and Z. mays genome, respectively, using a similar approach as in this study [10, 11]. The proportion of chloroplast DNA in the c0t-0.05 DNA fraction of M. acuminata is 4.2%, which is approximately a third compared to the c0t-1 DNA fraction of B. vulgaris and the proportion of organelle-derived DNA in the c0t-100 fraction of Z. mays is 1.7% which is much lower as in c0t-1 DNA fraction of B. vulgaris. No chloroplast DNA was detectable in the highly repetitive c0t fraction of S. bicolor while 10% chloroplast-derived sequences have been observed in the moderate c0t fraction of S. bicolor [8, 10, 11]. Another possible scenario explaining these differences is that chloroplast DNA was integrated into nuclear DNA and consequently c0t sequences with homology to chloroplast DNA might also originate from the nucleus. Chloroplast DNA can be found interspersed into nuclear DNA in many plant species including B. vulgaris [42–44]. Moreover, it has been assumed that chloroplast DNA incorporation into the nucleus is a frequent evolutionary event . However, it is very likely that the B. vulgaris c0t-1 clones containing chloroplast sequences originate from contamination of the genomic DNA used for reassociation. Macas et al. (2007) performed an analysis of genomic sequence data originating from a single 454-sequencing run of the Pisum sativum genome to reconstruct the major repeat fraction and identified retroelements as the most abundant repeat class within the genome . Similar analyses investigating crop genome compositions based on next generation sequence technologies have been reported [45, 46]. In our study c0t-1 DNA isolation was used for the classification of the major repeat families within the B. vulgaris genome and satellite DNA was identified as a highly abundant repeat class. In contrast to genome sequencing projects reflecting the whole genome in its native composition, c0t-1 DNA isolation represents only the repetitive fraction and enables therefore the targeted isolation of major repeats. Furthermore, less sequence data is necessary for the detection of major repeats using c0t DNA isolation compared with next generation sequence reads. We used only 442 kB (0.06% of the genome) sequence data for the detection of the major repeat families of the B. vulgaris genome while 33.3 Mb (0.77%) of P. sativum , 58.91 Mb (1%) of barley  and 78.54 Mb (7%) of soybean  were analyzed to detect the repeat composition. Therefore, c0t DNA isolation is a very efficient method for the identification of the repetitive DNA of genomes not sequenced yet. Macas et al. (2007) identified 17 novel tandem repeat families, and two minisatellites were physically mapped on P. sativum chromosomes . In order to demonstrate the potential of the c0t-1 DNA library for the detection of novel repeat classes we focused on the identification of tandemly repeated sequences, particularly on the identification of minisatellites. So far, the targeted isolation of minisatellites from plant genomes has not been described and this repeat type is only poorly characterized. It is not feasible to isolate most minisatellites as restriction satellites because of their short length, unusual base composition and hence, absence of recognition sites. The identification of nine minisatellite families as described here shows the potential of c0t DNA analysis for the rapid and targeted isolation of minisatellites from genomes. In addition we identified three satellite families undiscovered yet because of their moderate abundance. In contrast to typical G/C-rich minisatellites , all nine B. vulgaris families show a low G/C content: six of the nine families have a G/C-content between 24% to 33% (Table 1). Repetitive sequences are often subject to modification by cytosine methylation. It is known that deamination converts 5-methylcytosine to thymine, resulting in an increased AT-content . This might be a possible reason of the low G/C level of B. vulgaris minisatellites. Furthermore, the monomers of the B. vulgaris minisatellite families are different in sequence length and nucleotide composition from the 14 to 16 bp G/C-rich core sequence of minisatellites in A. thaliana or human [25, 26]. Most conventional plant satellites show a low G/C content . However, the FokI-satellite has a G/C content of 60% which is in contrast to the HinfI-satellite and AluI-satellite and other satellites described in B. vulgaris. Moreover, the monomer size of 130 bp of the FokI-satellite is different from the typical monomer size of plant satellites of 160-180 bp or 320 to 370 bp , whereas monomers of HinfI-satellite and AluI-satellite fall into the typical monomer size range. Only two of the nine minisatellite families (BvMSat03 and BvMSat04) show the typical ladder-like pattern in Southern analyses. Dimers of BvMSat03 were detectable after restriction of genomic DNA with BsmAI (Figure 2B, lane 2). However, partial restriction with BsmAI generates di- to decamers of BvMSat03 (not shown), indicating the highly conserved recognition site of BsmAI in BvMSat03-monomers. Hybridization of minisatellites to MspI and HpaII digested DNA indicates cytosine methylation of the recognition site CCGG. The HinfI-satellite and AluI-satellite family show also a strong methylation, while a reduced CNG methylation was detectable for some FokI-satellite copies. This might be an indication that some FokI-satellite copies lacking CNG methylation might be linked to the activation of transcription or to chromatin remodeling [49–52]. Little is known about the localization of minisatellites on plant chromosomes. So far, only two minisatellite families were physically mapped on chromosomes of P. sativum using FISH . In contrast to minisatellites of P. sativum detectable only on one and two chromosome pairs , respectively, the B. vulgaris minisatellites were detectable mostly on all 18 chromosomes with different signal strength, preferentially distributed in the intercalary heterochromatin and terminal chromosome regions. This pattern of chromosomal localization shows similarity to the distribution of microsatellite sequences on B. vulgaris chromosomes, which show a dispersed organization along chromosomes including telomeres and intercalary chromosomal regions, but are mostly excluded from the centromere . This is in contrast to the chromosomal localization of the highly abundant satellite families pBV and pEV and the satellite family pAv34 , which are detectable in large tandem arrays in centromeric/pericentromeric, intercalary and subtelomeric regions, respectively. Only BvMSat08 and BvMSat09 can be found in large tandem array blocks within the intercalary heterochromatin. The FokI, AluI and HinfI satellite families show dispersed localization in smaller arrays with different array sizes among chromosomes, preferentially in the intercalary heterochromatin and in terminal chromosome regions, respectively. The HinfI-satellite is predominantly distributed in terminal chromosome regions. The pAv34 satellite is also localized in subtelomeric chromosome positions . However, no copies of pAv34 were detected within the 13 kb BAC [EMBL:DQ374018] and the 11 kb BAC [EMBL:DQ374019] that contain a tandem array of the HinfI-satellite consisting of 14 and 26 monomers, respectively, indicating no interspersion of both satellite families. High resolution FISH on pachytene chromosomes or chromatin fibers using probes of pAv34 and the HinfI-satellite could be used to gain information about possible interspersion or physically neighborhood of both satellite families. Because of their small size (2-3 μm) and similar morphology (most chromosomes are meta- to submetacentric) FISH karyotype analysis of B. vulgaris has not been established yet. 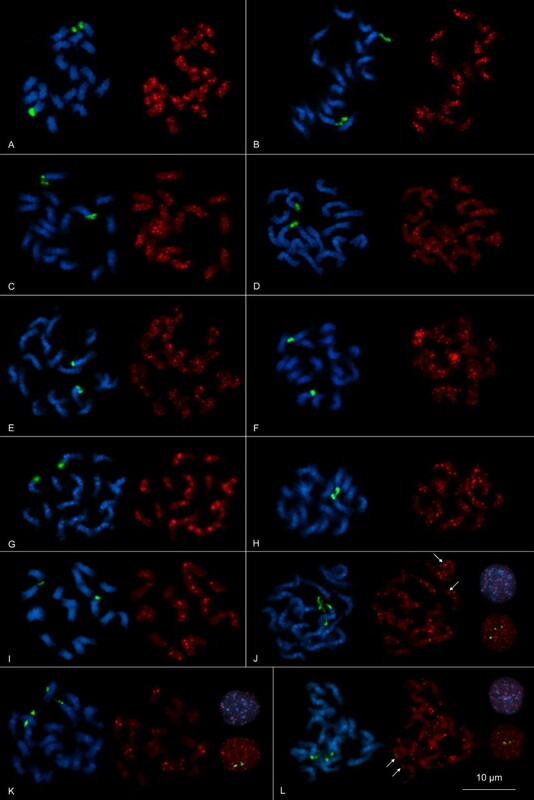 In contrast to conventional staining techniques , which are not efficient for reliable karyotyping of small chromosomes, FISH is an applicable method for the discrimination of the B. vulgaris chromosomes. Chromosome 1 can be identified by strong signals of terminal 18S-5.8S-25S rRNA genes while chromosome 4 is detectable by 5S rRNA hybridization patterns . FISH using probes of BvMSat08 enables the identification of another chromosome pair, due to the localization of the large BvMSat08 blocks on both chromosome arms. Hence, this minisatellite may be an important cytogenetic marker for future karyotyping based on FISH. Also, because of their specific chromosomal localization, the minisatellite BvMSat09, the AluI satellite and the HinfI satellite can serve as cytogenetic markers and support FISH karyotyping in B. vulgaris. It has been reported that human minisatellites originated from retroviral LTR-like sequences or from the 5' end of Alu elements [55, 56] but also other scenarios of the origin and the evolution were described in human and in primates [57, 58]. In plants, only few data are available about the origin and the evolution of minisatellite sequences. We propose a possible process which might describe the origin and/or evolution of minisatellites from microsatellites in the genome of B. vulgaris. Sequence analysis suggests that BvMSat07 originated from a microsatellite with the 5 bp monomer sequence GATCA. During microsatellite evolution complex arrays of six monomers evolved, which were subsequently tandemly arranged. The resulting minisatellite is 30 bp in size and consists of one GAAAA, AATAA and GTTCA and three adjacent GATCA monomers. The 5 bp subrepeats differing from the GATCA monomer sequence might have originated from the GATCA-motif by point mutation. The complex repeat shows structural similarities to higher-order structures of satellites, e.g. the human alpha satellite . A satellite higher-order structure is defined as monomers which form tandemly arranged highly homogenous multimeric repeat units . One complex repeat of the microsatellite might have been duplicated and enlarged by replication slippage resulting in a BvMSat07 array (Figure 4) and its copy number might have been increased by recombination between homologous loci. Another scenario of minisatellite origin and array enlargement can be concluded from the minisatellite family BvMSat05. The palindromic sequences within the highly conserved 50 bp sequence adjacent to BvMSat05 arrays may form secondary DNA structures, which may interfere with the DNA polymerase during DNA replication. This may result in slippage replication of the DNA motif upstream, contributing to the generation and enlargement of BvMSat05 arrays. Moreover, FISH revealed a subtelomeric localization of BvMSat05 clusters on some chromosomes, hence, the head to head junction of head to tail arrays typical for BvMSat05 may result from breakage-fusion-bridge cycles as postulated for tandem repeats near at terminal regions of rye chromosomes . It has been reported that palindromic sequences may induce genomic instability through provoking double strand breaks and recombination . Therefore, the head to head junction may also be the result of DNA repair following possible double strand breaks within BvMSat05 arrays. It has also been discussed that tandemly repeated sequences are derived from 3' UTR regions of retrotransposons . Analysis of retrotransposons in B. vulgaris [40, 63, 64] did not reveal any homology to minisatellite arrays or adjacent regions. However, we detected LTR sequences of a yet uncharacterized retrotransposon in the close vicinity of BvMSat04 arrays (not shown). Therefore, the evolution and dispersion of BvMSat04 arrays within the B. vulgaris genome might also be the result of the activity of this retrotransposon. In this study we focused in detail on the characterization of novel minisatellites and satellites. Nevertheless, these tandem repeats make up only 6.8% of the 517 uncharacterized c0t-1 sequences indicating that the c0t-1 library is an efficient source for the identification of further repeat classes. Examples are the 118 c0t-1 sequences possessing motifs of retrotransposon families as well as the identification of the envelope-like Copia element Cotzilla . We isolated highly to moderately repetitive DNA sequences from B. vulgaris originating from a c0t-1 DNA library. Providing the first comprehensive classification of repeats, we observed that the satellites pBV and pEV form the most abundant repeat families in B. vulgaris. We identified nine minisatellite and three previously unknown satellite families demonstrating that the analysis of c0t-1 DNA is an efficient method for the rapid and targeted isolation of tandemly repeated sequences, particularly of minisatellites from plant genomes. Minisatellites in B. vulgaris display a low G/C content and deviate strongly from the G/C-rich minisatellite core sequence observed in A. thaliana and human [25, 26] showing that a minisatellite core motif is not conserved in plant genomes. Physical mapping of the minisatellites on chromosomes using FISH revealed a mainly dispersed chromosomal distribution pattern. The possible origin, enlargement and amplification of minisatellites arrays were concluded for some minisatellite families. Complex structures of microsatellite arrays may play a role for the generation of minisatellites. Moreover, DNA sequences that contain palindromic motifs may be linked to slippage replication due to interfering with DNA polymerase during replication and may therefore be involved in the origin of minisatellites. Plants of Beta vulgaris ssp. vulgaris genotype KWS2320 were grown under greenhouse conditions. Genomic DNA was isolated from young leaves using the CTAB (cetyltrimethyl/ammonium bromide) standard protocol . The c0t-1 DNA was prepared with some modifications according to Zwick et al. . 640 μg of genomic DNA was dissolved in 1600 μl water and sheared at 99°C for 10 minutes followed by sonication at 80°C for 3 minutes to generate DNA fragments ranging in size predominantly between 0.5 to 1.0 kb. Renaturation of DNA fragments was carried out in a 0.3 M NaCl solution at 65°C after initial denaturation at 92°C for 10 minutes. The renaturation time was calculated according to Zwick et al. . S1 nuclease treatment followed to remove single stranded DNA and single strand overhangs on renaturated double stranded DNA. The enzyme was inactivated by adding stop solution (3 M Tris pH 8.0, 0.5 M EDTA) according to Ostermeier et al. and incubation at 72°C for 20 min. Blunt end c0t-1 DNA fragments were ligated into the SmaI site of dephosphorylated pUC18 vector. After transformation of XL1Blue cells (Stratagene), positive clones were identified by blue/white screening and transferred into 384-well plates, grown in LB freezing medium and stored at -80°C. Clones were grown in Terrific Broth (TB) medium (1.2% peptone, 2.4% yeast extract, 72 mM K2HPO4, 17 mM KH2PO4 and 0.4% glycerol) including 100 μg/ml ampicillin at 37°C. Small-scale plasmid isolation was performed by the TELT procedure . Plasmids were sequenced on an ABI 3730XL sequencer (Applied Biosystems; Foster City, CA/USA) using BigDye terminator chemistry, in forward (5'-CGTTGTAAAACGACGGCCAGT-3') and/or reverse (5'-CAGGAAACAGCTATGACCATG-3') directions. Sequences in c0t-1 DNA library, which are homologous to previously characterized B. vulgaris repeats, were identified using local BLAST option of the BioEdit software  with a representative query sequence of the repeat family. Novel c0t-1 DNA sequences were characterized using the EMBL database homology search against nucleotide and amino acid sequences and an e-value threshold of 10-3. The remaining fraction of the c0t-1 DNA without homology to EMBL database entries was used for the identification of tandem repeats using Tandem Repeats Finder . Subsequently, c0t-1 sequences containing tandem repeats were used as query sequence for the identification of further DNA copies from BAC end sequences , (Holtgräwe and Weisshaar, in preparation) to reveal their abundance and array structures. The DNA sequences of each tandem repeat family were aligned manually using the Phylogenetic Data Editor . The detection of G/C content and identity values of each tandem repeat family was determined by a G/C Content Calculator and ClustalX  using at least 20 randomly selected monomers of representative tandem arrays. Sequences contigs have been established using DNASTAR Lasergene v8.0. Primer pairs were derived from conserved regions of minisatellite and satellite monomers. The PCR reactions with 50 ng genomic DNA and a final primer concentration of 0.5 μM were performed in a 20 μl volume containing 0.2 mM dNTPs and 1 unit of GoTaq polymerase (Promega). The PCR conditions were 94°C for 3 min, followed by 30 cycles of 94°C for 30 s, 47°C to 65°C depending on the primer melting temperature of each repeat family, for 30 s, 72°C for 40 s and a final incubation at 72°C for 5 min. For the generation of probes for Southern hybridization and fluorescent in situ hybridization, the same primers or M13 primers were used to amplify tandem repeats from c0t-1 clones. For Southern hybridization 5 μg of genomic DNA was restricted with different enzymes, separated on 1.2% agarose gels and transferred onto Hybond-XL nylon membranes (GE Healthcare) using alkaline transfer. Southern hybridizations using 32P-labelled probes were performed using standard protocols . Filters were hybridized at 60°C and washed at 60°C in 2× SSC/0.1% SDS for 3 h. The signals were detected by autoradiography. The meristem of young leaves was used for the preparation of mitotic chromosomes. The maceration of plant material was performed in an enzyme mixture consisting of 0.3% (w/v) cytohelicase (Sigma), 1.8% (w/v) cellulase from Aspergillus niger (Sigma), 0.2% (w/v) cellulase Onozuka-R10 (Serva) and 20% (v/v) pectinase from A. niger; followed by spreading of nuclei on slides. Probes of tandem repeats were labelled with biotin-16-dUTP (Roche) by PCR according to Schwarzacher et al. while 18S-5.8S-25S rRNA genes were labelled by nick-translation with digoxygenin-11-dUTP (Roche). The hybridization and detection were performed according to Schmidt et al. . Chromosome preparations were counterstained with DAPI (4',6'-diamino-2-phenylindole) and mounted in antifade solution (CitiFluor). The examination of slides was carried out with a Zeiss Axioplan2 Imaging fluorescent microscope with filters 09 (FITC), 15 (Cy3) and 02 (DAPI). The images were acquired with the Applied Spectral Imaging v. 3.3 software coupled with the high-resolution CCD camera ASI BV300-20A. The contrast of images was optimized using only functions affecting whole image equally by Adobe Photoshop 7.0 software. Falk Zakrzewski, Torsten Wenke contributed equally to this work. Falk Zakrzewski acknowledges a fellowship and financial support of the FAZIT foundation. This work is funded in part by the BMBF grant "Verbundprojekt GABI-Beet Physical map: Physikalische Genomkarte der Zuckerrübe zur Nutzung in der Pflanzenzüchtung", sub-projects 0313127B and 0313127E. We thank Ines Walter for excellent technical assistance. FZ and TW wrote the paper, participated in the bioinformatic analyses of the c0t-1 library, carried out the alignments of the tandemly repeated c0t-1 sequences and performed the molecular genetic studies. DH and BW performed the sequencing of the c0t-1 clones, provided the BAC end sequence database and helped to draft the manuscript. TS participated in the design and coordination of the project and has been involved in the writing of the article. All authors read and approved the final manuscript.